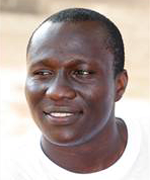 Jeleel is the National Co-ordinator of Inclusion Ghana. He is responsible for providing overall direction in the development and implementation of policies and programs of Inclusion Ghana. Jeleel is a Registered Organization Development Practitioner with the International Society for Organisation Development, USA. He has significant knowledge and experience in Training for Impact Approaches, Management for Development Results (MfDR) Planning, Organizational Assessments, Emotional Intelligence Training, Research, Strategic Planning, Policy Influencing, and Setting up Monitoring & Evaluation Systems. He is a webmaster (New Jersey Institute of Technology), and has certification in Java Programming (Massachusetts Institute of Technology). Jeleel�s background gives him a unique ability to articulate, promote and advance Inclusion Ghana�s mission. Jeleel is a strong nationalist and a committed development professional. He has been actively involved in many local, national and international projects using project cycle management approaches. He is currently the board secretaries of the Autism Society of West Africa and the Ghana Civil Society Platform for Social Protection. He is also a member of the board for Inclusion Africa and an expert representing the Secretariat of the African Decade for Persons with Disabilities to provide technical assistance and monitor the African Union and its organs in mainstreaming disability in different programmes. Jeleel believes that underneath everything we are, underneath everything we do, we are people, connected and interdependent. When we reach out a hand to one person with intellectual disability, we influence the condition of all. Together, let's inspire hope and create opportunities for a better tomorrow for persons with intellectual disabilities. Alice is the Parents Mobiliser of Inclusion Ghana. She has a first degree in Sociology from the University of Ghana and a Master�s degree in Public Health (Applied Health Social Science) from University of Ghana�s School of Public Health. 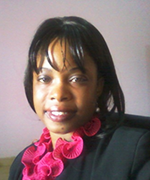 She has extensive knowledge in areas such as Stakeholder Consultation, Behaviour Change Communication, Community Mobilization for Project Implementation and Monitoring and Evaluation. Alice has over 4 years experience working as a health program personnel both in and outside Ghana. She has worked with the US Agency for International Development (USAID) Liberia Mission as a Health Team Program Assistant and with the Ghana Health Service Head Quarters particularly with the Policy, Planning, Monitoring and Evaluation Division. She has worked with many organizations through volunteer work in sensitizing and raising awareness of the rights and needs of persons with intellectual disability and their families. Her years of working experience especially in mobilizing parents of persons with intellectual disability has made her reckon that persons with intellectual disabilities and their families are neighbours, community members and fellow citizens who suffer stigmatization, discrimination and social exclusion but need to be recognized as full citizens, and must enjoy the full rights as anybody else. She believes that by encouraging physical, cognitive and social development, as well as speech development through love, respect and creativity, these people can feel valued and can become contributors to their communities� development. 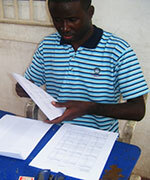 Nortey is the office assistant for lnclusion Ghana. He is a person with autism, born on 25th June 1983. He has been trained to live independently. He has some working experience, having worked with many companies. His first job placement was with United biscuit factory at Tema (Ghana) in the fields of packing and sealing biscuits. He then went on to work with Dry Food Processing at Spintex Rd (Ghana) in the fields of marking boxes and packing boxes of macaroni. He also worked with in �His Time publications� in the fields of folding book covers, count and fold sheets and arranging sheets in pages. Nortey is an expert in cleaning and putting things in their right places. His years of working experience have given a strong indication that persons with autism can work in Ghana.